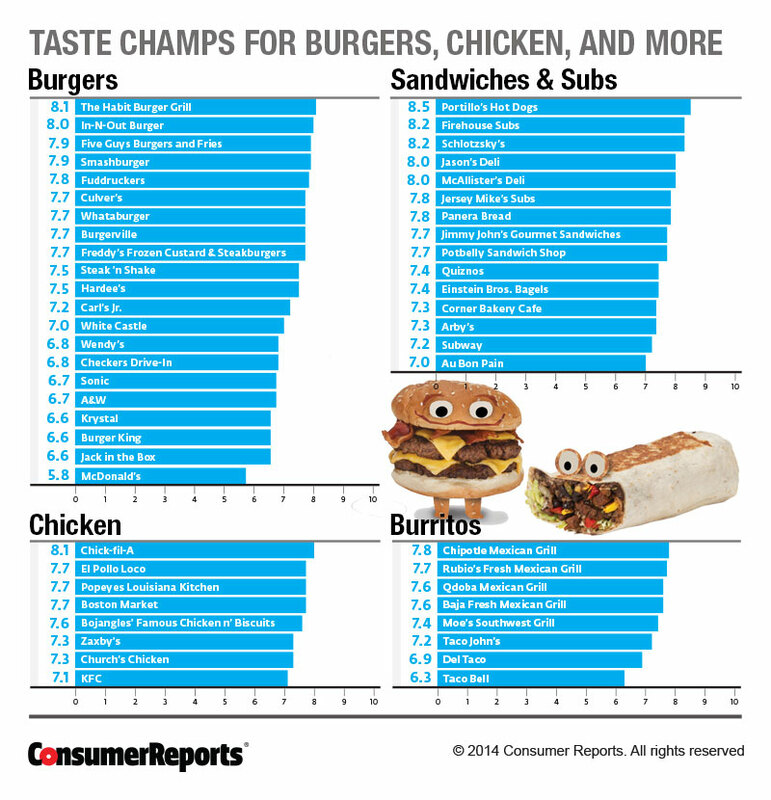 That’s according to Consumer Reports’ latest fast-food survey. After devouring 96,208 meals at 65 chains, our readers told us that quality of the food has become more important in their dining decisions, and convenience of location is less so than in our 2011 report. They could be reasons the traditional fast-food chains are losing their edge: Diners, especially younger adults in the millennial generation, may be more willing go out of their way to get a tasty meal. Restaurants are a part of the millennials’ social structure, and they choose to spend less at meals so that they can eat out more often, says Darren Tristano, executive vice president of Technomic, a food-service research and consulting firm. “Fast-casual dining in places like Chipotle and Panda Express lets the consumer guide the staff to prepare their meal just the way they like it,” he adds. In contrast, he says many of the traditional chains have lagged in offering higher-quality ingredients. Chains such as Chipotle, Noodles & Company, and Panera are even offering meat that has been produced without the use of antibiotics in animal feed, an attraction for many health-conscious consumers. And breakfast is a new fast-food battleground, with more chains offering meals, includingTaco Bell, which has introduced the Waffle Taco to take on McDonald’s McGriddles. Take a look at our battle of the breakfast sandwiches. Here you'll find our takes on burgers, burritos, chicken, and sandwiches and subs, as well a listing of readers' favorite alternatives to fast food. Get more details about breakfast sandwiches, getting more for your money, regional gems, nutrition, cleanliness, and service. Check our report on fast food fare that isn't picture-perfect. If you prefer to eat what you cook yourself at home, learn how to be a smarter supermarket shopper. *Source: Consumer Reports National Research Center. Differences of at least 0.4 are meaningful for chicken, burritos, and sandwiches. The meaningful difference among burgers is 0.5 or more.